Labanos – Scientific name: Raphanus sativus Linn. Radish, common name for any member of a genus of annual or biennial herbaceous plants of the cabbage family, particularly the common garden radish. Radishes apparently originated in China. They are grown throughout the North Temperate Zone for their pungent root, commonly used as a relish. Varieties differ in size and shape, and range from white to red or yellow in colour, depending somewhat on the growing season. Thus, spring radishes are small and round, whereas summer varieties are larger and more slender; both are usually eaten raw, but the still larger autumn varieties are generally boiled. The Japanese large, white radish called the daikon, mooli, or muli may also be pickled or eaten raw. Scientific classification: Radishes make up the genus Raphanus of the family Brassicaceae (or Cruciferae). 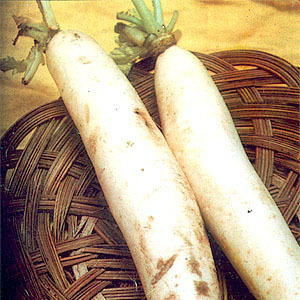 The common garden radish is classified as Raphanus sativus and daikon or mooli as Raphanus sativus variety longipinnatus.